Football fields, or football pitches, are the rectangular playing surfaces used for the sport of football (soccer). While grass is the typical playing surface, football can also be played on artificial turf or informally on dirt surfaces. The long length of the field, bounded by the touchlines, must be between 295’-394’ | 90-120 m, while the shorter width, defined by the goal lines, is between 148’-295’ | 45-90 m. Goals are located on the center of each opposing goal line and are 24’ | 7.32 m wide. 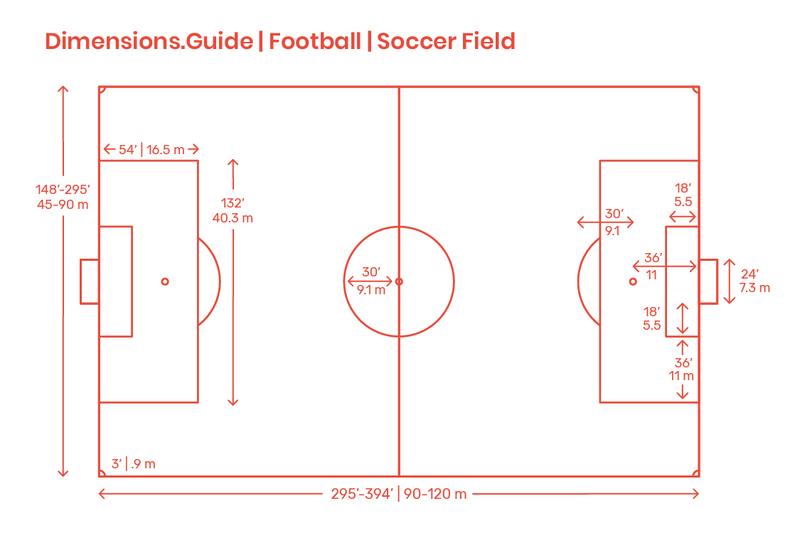 The football pitch is split with a half-way line and a center circle with a radius of 30’ | 9.15 m.
Other crucial areas of the football field include the goal area and the penalty area/marks. The goal area is a rectangular zone centered on the goal starting 18’ | 5.5 m out from both goalposts and extending 18’ | 5.5 m into the pitch. Around this area is the larger penalty area that is 54’ | 16.5 m from the posts and 54’ | 16.5 m out. For penalty kicks, the penalty mark is centered at 36’ | 11 m from the goal. A circular penalty arc extends at a radius of 30’ | 9.15 m from the penalty mark. Corner radii are set at 3’ | .9 m.